When I hang out with friends, the soccer fanatics will always choose to hang out at some stupid place with a stupid TV screen showing some stupid live football match and, like, we’d be stuck there all night! Last Saturday, I was out with my friends. We were just hanging around, shopping, eating, the usual stuff. While we were having dinner, the perennial question came: What shall we do after dinner? But then, he looked pretty sad all night. I tell you, soccer fans are so troublesome. But I have a solution! Don’t say I only know how to complain! The solution is: Choose Freedom! Aww, what a cute doggy! Well, let’s hear what our cute doggy has to say. No, seriously. Do you know what this means? 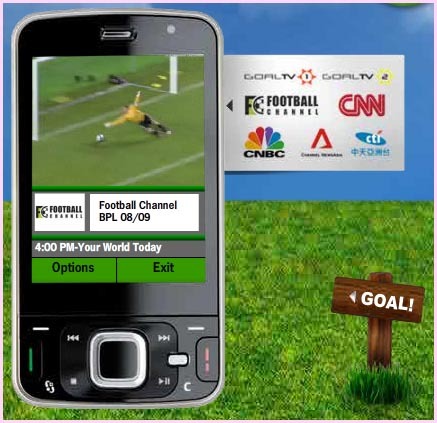 This means that soccer fanatics can now hang out with their pals any time they want, without having to miss any soccer matches, ever! 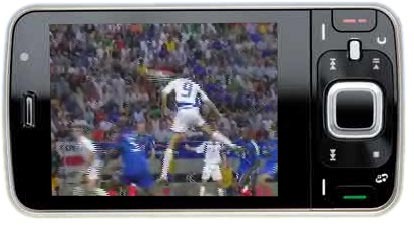 With StarHub TV on Mobile, you can now watch “live” TV on your mobile phone. That means my silly friend will be able to watch “live” Barclay Premier League matches when he is out! That’s right. He can bring his football matches with him wherever he goes! How cool is that?! ARE YOU READING THIS, friend who shall not be named? This also means that you don’t have to make your friends sit in a noisy pub to watch matches with you, anymore. Hah! There’s also the news, as well as crazy Taiwanese variety shows, when you’re bored with soccer. Here’s a list of available channels on StarHub TV on Mobile. The service is easy to use. And I know all you smart football fans will have no trouble with it. The user interface is friendly and you can channel surf easily. It even comes with a TV guide so you won’t miss any important programmes. The TV guide is really cool. The show times for all the shows in all the channels are listed clearly AND you can set your phone alarm to remind yourself to watch a particular show. But I think my friend doesn’t need an alarm to remind him to watch football. He has an inbuilt sensor that automatically goes off when he’s needed at the screen. I think maybe I should get it, too. It’ll be nice to watch the news while I’m outside since I always have time to kill between meetings and auditions and events and shoots. At the very least, it would be something to motivate me to pay more attention to world affairs, a subject which instantly bimbolises me when I’m put to the test. I hope StarHub will bring in more channels. Like, maybe AXN or Star World or HBO or, uh, Disney Channel? Haha. I never have time to watch TV at home, so I would love to be able to bring TV out with me! Well, give the service a try. Maybe if more people subscribe and request, StarHub will have a reason to bring in all the extra channels! How about paying our cute doggy a visit to find out more and to subscribe? 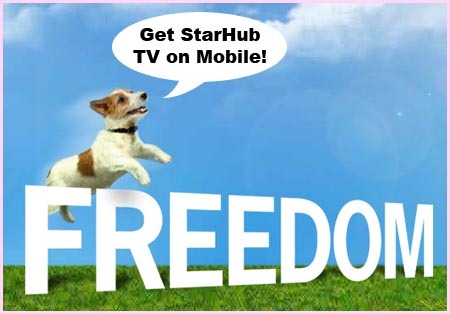 StarHub TV on Mobile is FREE for StarHub TV Sports Group customers, but only till May 31, 2009, so do hurry and get your service now! @RN: The dog is named Sparky IIRC. Love it but hate Starhub. I dun want to get started here. @Sheylara: Won’t you get offended that during a gathering, one of your friends kept playing on his mobile phone the whole night, ignoring the rest. I know I will. you don’t sound very sure yourself. However, I think by clicking on Sparky’s link, Sheylara actually earns some revenue. so start clicking ppl! RN1209: Thanks! 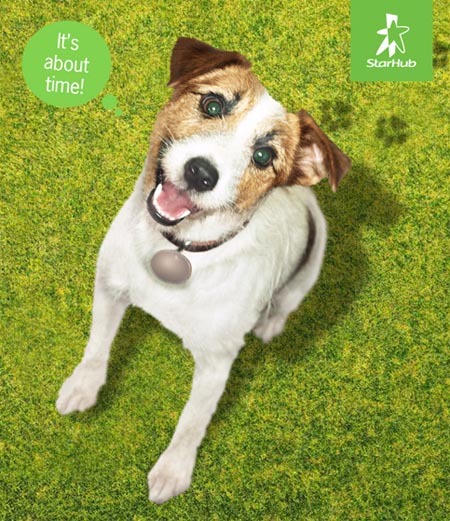 :) StarHub commercials are always quite entertaining, huh? tiger4: No I won’t cos our group is a big group and someone is always doing something else at any time. lol. Sometimes I will go hang out with them but at the same time spend the whole day working on my lappy while they chat or play games or whatever. Haha. We’re so close that all these things don’t matter to us. We just enjoy being in each other’s company, whether or not we actually do things together! Me <=== Secret Friend … I am exposed!!! !